DHA is extremely proud and congratulates alumni Ty Smith and Ty Taylor on being selected 17th and 214th overall in the 2018 NHL Draft. Ty Smith, 18, was selected in Round 1, 17th overall by the New Jersey Devils.Smith attended the Delta Hockey Academy during the 2014-15 season, leading the CSSHL’s Bantam Prep Division in scoring with 28 points (9-16-28) in 16 games en route to being named the Bantam Prep Division MVP. The Lloydminster, Alta. product also registered seven points (3-4-7) in four post-season games. Smith has spent the past two seasons in the Western Hockey League with the Spokane Chiefs, tallying 107 points (19-88-107) in 137 career games. He was named the 2018 WHL Scholastic Player of the Year. 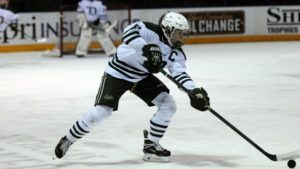 Ty Taylor, 18, was selected Round 7, 214th overall by the Tampa Bay Lightning. Taylor attended the Delta Hockey Academy during the 2015-16 season where he helped his team capture the CSSHL’s Midget Prep Championship posting a division-best 1.46 goals-against average and a league-best .943 save-percentage. The Richmond, B.C. product has spent the past two seasons in the British Columbia Hockey League with the Vernon Vipers. During the 2017-18 season he led the BCHL in goals-against average (1.87), save-percentage (.943), while being named the BCHL Top Goaltender and to the BCHL First All-Star Team. Taylor will attend and play NCAA hockey at the University of New Hampshire beginning in 2019. DHA wishes to congratulate Ty Smith, Ty Taylor and 4 other CSSHL Alumni, including Jacob Bernard-Docker (Edge), Joel Hofer (POE), Angus Crookshank (BWC), and Matthew Thiessen (Rink) on being selected in the 2018 NHL Draft.